Recruitment Chatbots: Is The Hype Worth It? understanding employee satisfaction levels and much more. Performing these tasks, along with finding talented candidates, is easier said than done, indeed. There should actually be an assistant who takes up most of the repetitive jobs, releasing recruiters to focus on strategic and decision-related work. Tech experts realize this and aim to design the perfect savior for recruiters, recruitment chatbots. We are pretty sure that everyone is aware of what chatbots are and what they do. What are recruitment chatbots exactly about? Let’s put it out in simple words. Recruitment chatbots, considered as an HR manager’s dream assistant, are basically conversational interface platforms that perform the preliminary recruitment process. These chatbots are powered with AI and NLP capabilities, which make them more disruptive and powerful. Let’s check some concrete recruitment chatbot use cases, capabilities and potential that brings in breakthrough results. Once candidates apply on a company’s job site, chatbots can initiate a conversation with them. While conversing with them, chatbots ask them several questions, such as work experience, previous company details, interest areas to name a few. Once the conversation is complete, chatbots evaluate the candidate for the relevancy of the vacant position. Assessing the job requirement, the conversation and resume details, the recruitment chatbot can decide whether a candidate fits the open position or not. Intelligent chatbots can access the calendar of recruiters to check for their availability. Accordingly, they can then schedule an interview date and time for relevant candidates. Before joining any company, it is obvious that candidates will have a few queries or doubts about the job position, work environment and salary structure. Recruiters have to make time for such calls. However, with chatbots, recruiters gain some much-needed assistance. With prompt replies and instant availability, chatbots have become one of the disruptive newcomers in the tech market. To stand out of the noise, recruiters should potentially tweak their recruitment strategy and make it more candidate-centric. The time that candidates take to send resumes and recruiters get back to them should be negligible. Chatbots can make this happens. Chatbots can get back to candidates almost instantaneously, making both applicants and recruiters satisfied on that front. No doubt, recruitment chatbots are trends that will transform the face of recruitment. These chatbots come with a series of opportunities and possibilities, having the potential to disrupt the recruitment space. However, along with incredible benefits, these chatbots opens up new doors of challenges. Chatbots are no exception when it comes to technical faults and glitches. Let’s run through some of the thorny problems recruitment chatbots may encounter. 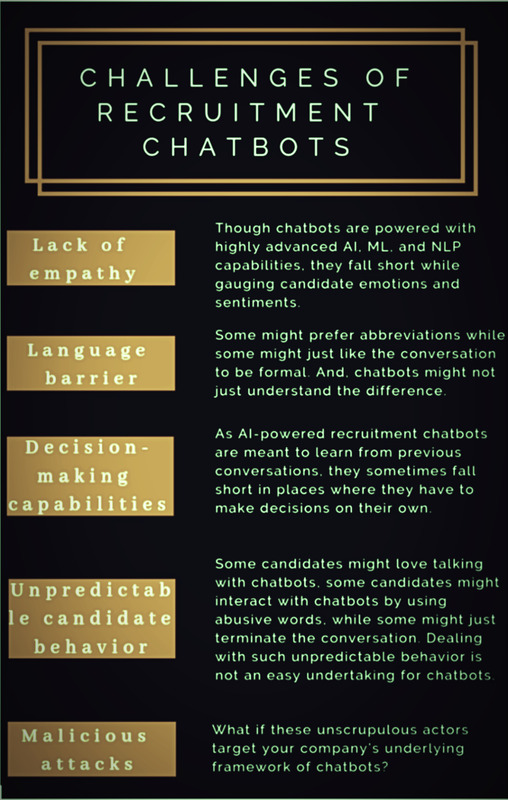 Though chatbots are powered with highly advanced AI, ML and NLP capabilities, they fall short while gauging candidate emotions and sentiments. Besides, these chatbots fail to understand humor. No jokes, no human touch, no empathy, no humor while talking might make the conversation less than engaging for candidates. Sometimes, chatbots are designed with limited information about the company. If candidates ask questions that are unfathomable to chatbots, these chatbots can get confused, and they then provide irrelevant answers. Incidents like these can disappoint and frustrate candidates. Every person has a unique talking style. Slang, language and writing differ from person to person. Some might prefer abbreviations while some might just like the conversation to be formal. Sometimes, understanding the query or statement becomes difficult for chatbots. As AI-powered recruitment chatbots are meant to learn from previous conversations, they fall short in places where they have to make decisions on their own. For example, consider a situation where a chatbot asks a question like, “Do you have fair knowledge about big data?” and the candidate answers “Yes, but I haven’t worked on any projects yet.” Here, the candidate states that they have sound knowledge on the concept and yet no hands-on experience. It's obvious that big data concepts make sense to data scientists, software developers, and other such highly experienced employees. A newcomer will not be suitable for the position, truly. A not-so-well-designed chatbot will get confused at this point, and it might schedule an interview with the newcomer, thereby making a wrong decision. Humans are highly unpredictable. Some candidates might love talking with chatbots, some candidates might interact with chatbots by using abusive words, just for fun (sometimes), while some might just terminate the conversation. Dealing with such unpredictable behavior is not an easy undertaking for chatbots. Think about hackers. What if these unscrupulous actors target your company’s underlying framework of chatbots? What if your chatbots are attacked, scripted and turned into an evil bot? What if these evil chatbots schedule interviews with only irrelevant candidates? Or, send abusive replies to candidates? Well, that’s getting even scarier. Having a high potential to connect with engaging and talented candidates, scheduling interviews and answering queries in real-time, recruitment chatbots have truly become the need of the hour in the recruitment space. But at the same time, if we consider the other side of these recruitment chatbots, then the question arises. Is all the hype around recruitment chatbots worth it? If chatbots can streamline the recruitment process, reduce a recruiter’s burden and help save time, then why not give it a try? But, before leveraging or designing a chatbot for your company, be mindful of the points mentioned above and find concrete ways to overcome them. Most importantly, make your chatbot’s underlying infrastructure robust and tighten your security policies to safeguard against hackers and their evil activities.